When travelling along the byways of South Africa one is always likely to come across a place that will remain in your memory. Kenton on Sea is such a place. After arriving in Port Alfred after a whole day of driving we were sadly disappointed in the accommodation we had booked. So much so that we decided to leave immediately and head for home. As we had seen Kenton on Sea on our way to Port Alfred we decided to explore the two beautiful rivers and the small village between them on our way back. While sitting admiring the Kariega river a game ranger arrived and parked near us, I'm an avid fisherman and will always ask a local for advice when looking for somewhere to cast my line. Who better than a game ranger? I approached him and chatted for a while and then broached the subject of accommodation in Kenton. He recommended that I visit a local estate agent which I did and I soon had accommodation in a house in the village with a beautiful view out over the Boesmans river at a very reasonable price. 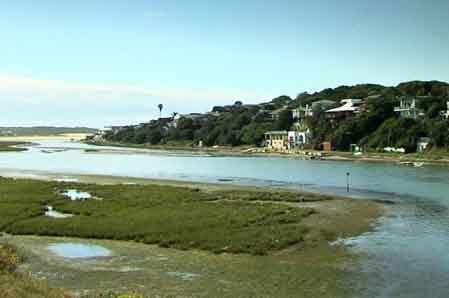 Kenton on Sea has two rivers, the northerly one being the Kariega River and the southerly one the Boesmans River. Both rivers are tidal and when the tide comes in the estuaries are flooded as the sea pushes its way upriver. This is the time to get your line in the water and try for some fish and with a bit of luck you'll soon have something for the pan. Kenton on Sea “ where the sun spends the winter” not only has two rivers but a number of pristine beaches where swimming is safe. The weather is lovely, even in winter, where day time temperatures average about 20 degrees celsius. In a small village its always a problem to find something to do. Kariega Game Reserve is situated in a malaria free area and that means that visitors do not have to take medication before visiting it. For those wanting to spend a couple of days in the park there are two lodges with accommodation for visitors. Kariega Main Lodge has a number of luxurious and spacious 4-star rated, 1 to 4 bedroomed log chalets, all en-suite with their own viewing decks. Some even having their own private pools. The Ukhozi Lodge has four superbly appointed luxury suites and a restaurant that prepares traditional South African cuisine. For those who want to do more than just view game there is hiking on marked trails, game drives in open vehicles, river cruises on the Kariega river, canoeing, mountain biking, fishing, horse riding and golf. Grahamstown and Port Alfred are the two towns closest to Kenton on Sea and they are also worth a visit. Port Alfred has a lovely marina on the Buffalo river and its extremely interesting to watch boats leave through the mouth of the river and take on the surf as they make their way out to sea. Of course coming back is even more interesting as they have to race the waves for the safety of the river mouth. Exploring the Eastern Cape is a great way to spend a holiday and what better place to stay while you are doing it than Kenton on Sea. Stop off and see for yourself when you next visit the Eastern Cape. I'm sure you will fall in love with the place like I did.